Recipe Archetype: This is the methods and materials of the recipe at the most abstract level, which helps you to substitute ingredients, modify the recipe, and improvise from it in the future. Recipe Overview: This shows how this recipe fills out its archetype with specific ingredients, and also provides some detail on the methods being used. Tips: Tips for the recipe that don’t have a clear place in the instructions. These tips are usually about shopping for the right kind of ingredients, finding rare ingredients, or particular pre-cooking preparations. All salsas are a combination of pickling and maceration. You take a fresh ingredient (usually starting with onions and tomatoes) and soak it in acidic liquid (usually citrus juice), which softens it, mellows its flavors, and preserves it from spoiling. In this instance, we’re flaunting convention by dropping out the tomatoes and onions altogether and focusing only on the two title ingredients: mangos and jalapeños. I’m also insisting on lime juice instead of lemon juice; I know that it’s a pain to squeeze a bunch of limes, but their juice is more intensely flavorful and acidic, which is needed to cut the sweetness of the mangos. 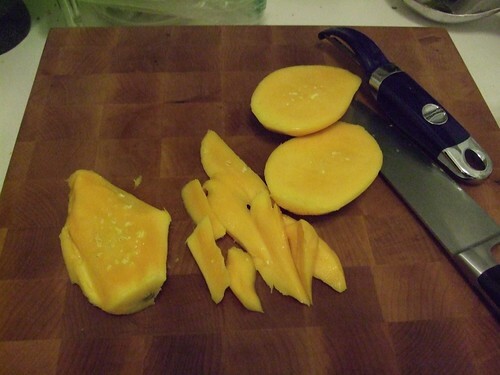 Look for Manila / Ataulfo mangos, which have non-fibrous flesh and a very sweet taste. 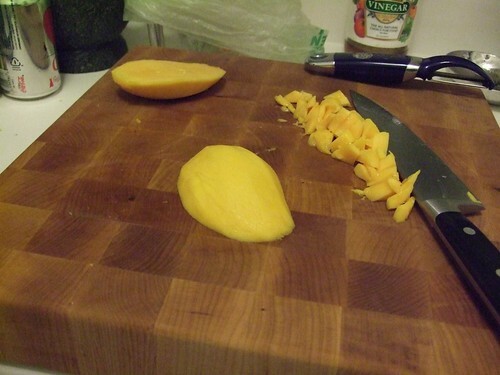 If you can’t find them, any other ripe mango will do. 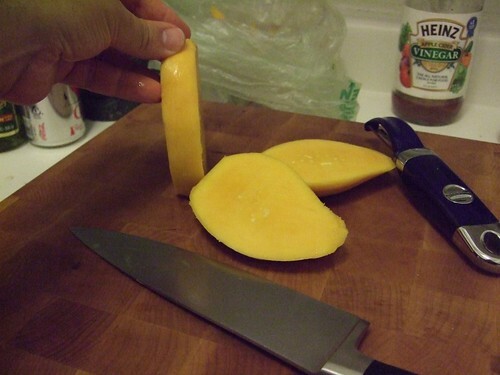 Pick smallish mangos (a bit larger than your fist) that are very ripe or even overripe. The flesh of the fruit should give slightly when you press on it with your thumb, but bounce back; also, a good sign of ripeness is that the skin near the stem is beginning to wrinkle. If you see some very overripe mangos on reduced sale, buy them. You can cut out the brown parts and save the good parts, which will most likely be super-sweet…just buy a few extras to make up for brown parts you cut out. 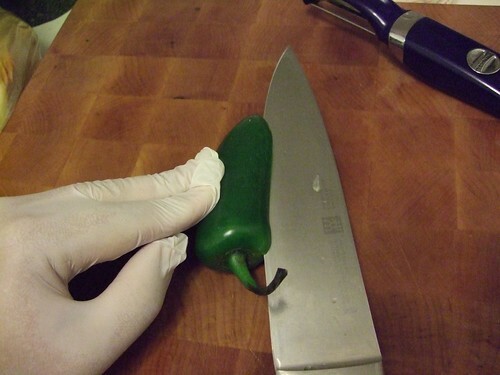 If you wear contacts (and even if you don’t, really), wear gloves when handling the hot peppers. Capsaicin, the chemical that makes hot peppers hot, is also what goes into “pepper spray,” and rubbing your eyes after handling peppers will make you feel like you’re in the middle of an anti-WTO street protest. You can buy disposable latex or nitrile gloves at nearly every grocery store and pharmacy, in the cleaning goods aisle. This recipe can be eaten after an hour or so of marination, but it’s even better if it marinates overnight. 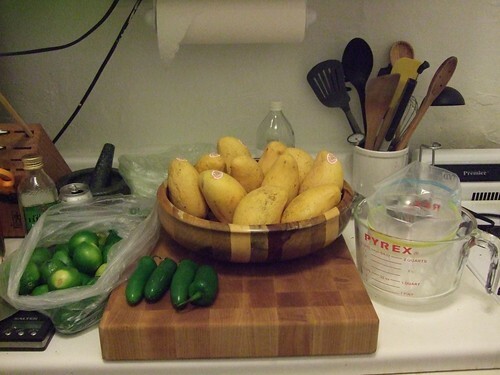 To make the maceration/pickling more effective, put the salsa in a large freezer bag. This allows you to remove most of the air from the container and thus ensure that all of the mixture is covered by liquid. 1. 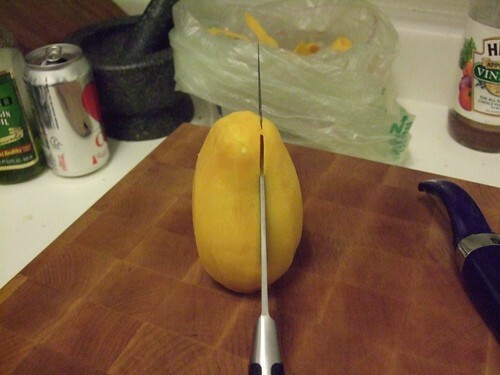 Peel and dice the mangos. Any method will work, but if you want to see how I do it (after years of experience), follow steps 2–6. Otherwise, skip right to step 6. 2. 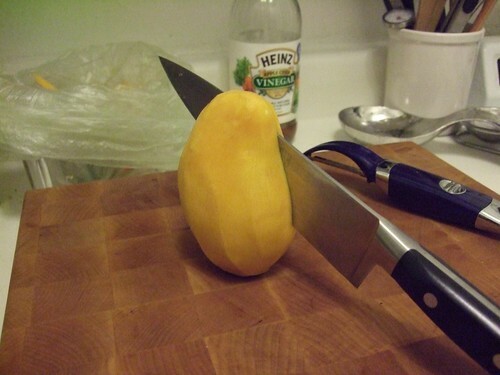 Take a mango and peel it using a peeling knife. 3. 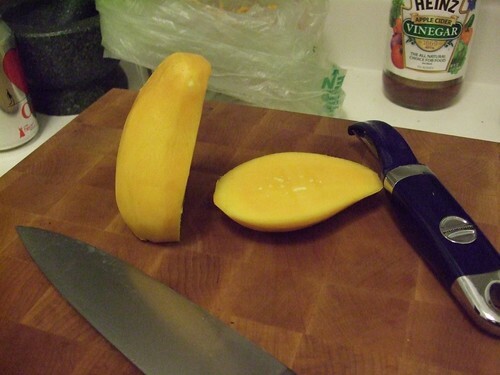 Hold the mango upright and slice off the fleshy “cheeks” from both sides of the seed. Mango seeds of this variety are usually flat and sit in the middle of the widest part of the fruit. Try to get as close to the seed as you can without cutting into the fibers surrounding the seed. 4. Shave the remaining flesh off of the seed. This can be a bit tricky at first, as you have to learn to “feel” the shape of the seed through knife-pressure and sound. Don’t worry about cutting through some of the seed-fibers, just try to get as much of the good stuff off of the seed. 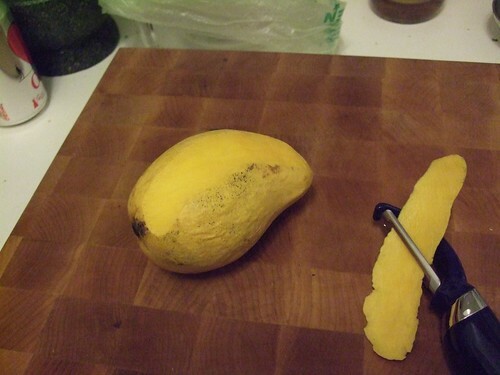 When you’re done, you can put the seed in your mouth and drag your teeth along it to salvage any remaining mango. Chef’s treat! 5. Dice the irregular, shaved bits roughly and set them aside. 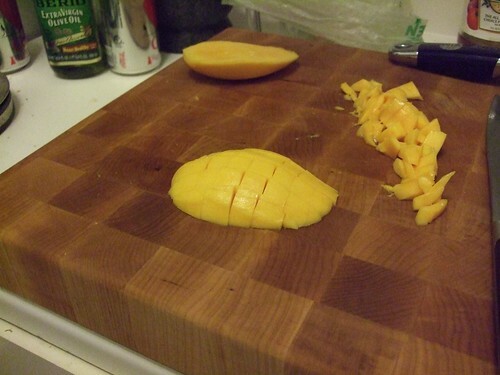 Put one of the “cheeks” cut-side-down on the cutting board. Cut it lengthwise. Give it a quarter-turn, and then cut it crosswise. It should look like the images below. Repeat for the other cheek. 6. 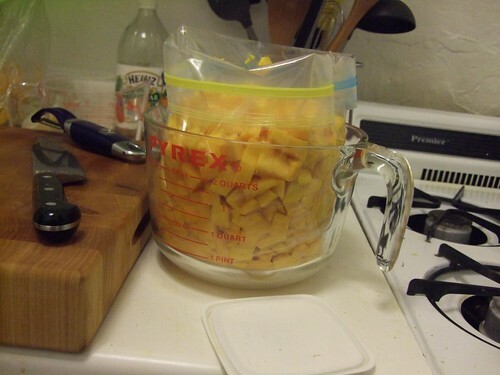 Move all of mango pieces to your container (I’m using a freezer bag resting in a glass bowl). 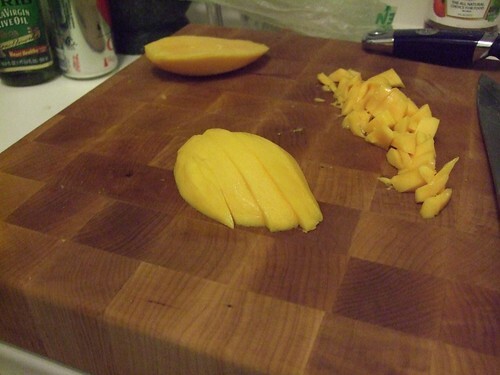 Sprinkle a pinch of salt on the mangos pieces. 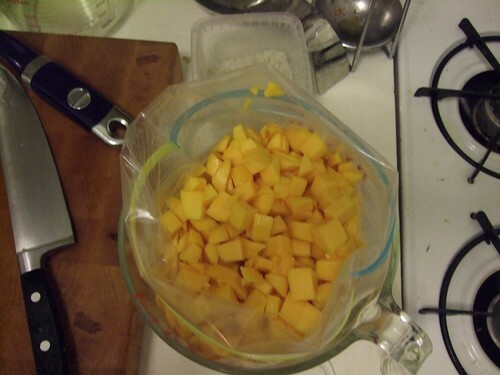 Repeat steps 2-6 for the remaining mangos, sprinkling a bit of salt on each new layer of mango pieces. 7. The salt needs some time to draw out the mangos’ juices, so set yourself to squeezing all of the limes. As you pour the lime juice in, the level of the liquid should come up to about 2cm below the top of the mangos. 8. De-seed and dice the jalapeños into small cubes. 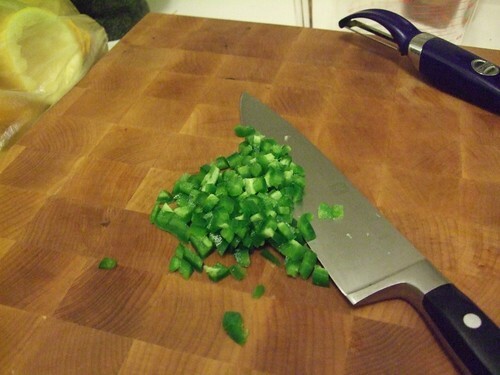 Again, I’m only showing you my dicing technique below, so skip ahead to step # if you aren’t interested in how I dice peppers. 9. 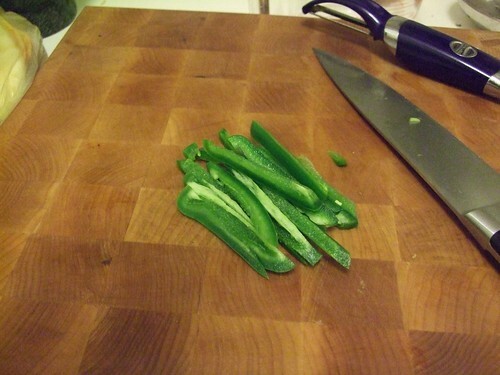 Hold a jalapeño down against the cutting board, with the stem facing you. 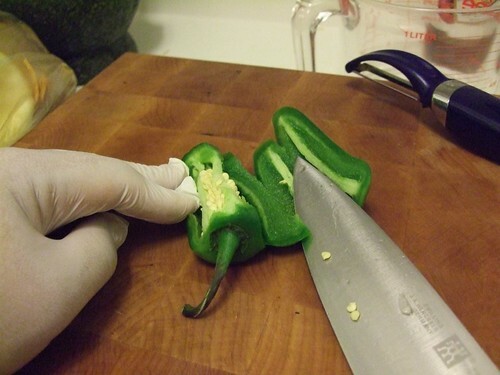 Make a cut on the side of the pepper, then turn your blade downwards to cut around the stem. 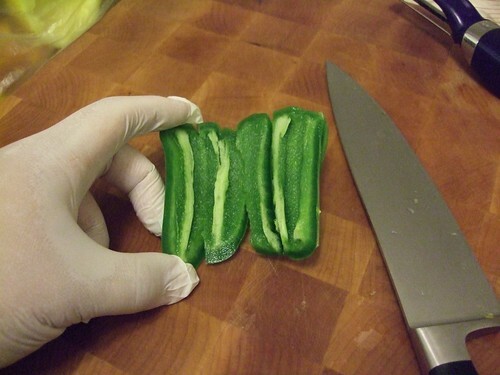 With your blade parallel to the board, roll the jalapeño back as you continue to cut, as if you’re peeling a layer off of a cylinder. Throw away the seed pod. 10. You should now have a mostly-flat slab of jalapeño. Cut this lengthwise into thin strips. Then, gather these strips together and cut them crosswise into small cubes. 11. 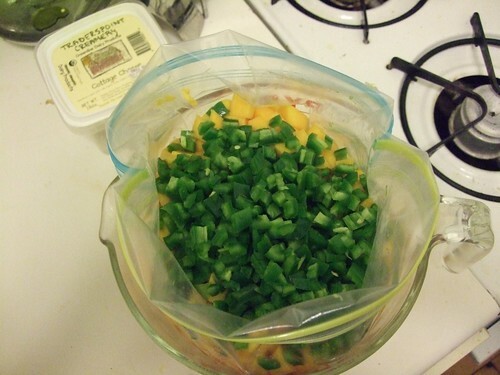 Throw the jalapeños on top of the mangos and mix. 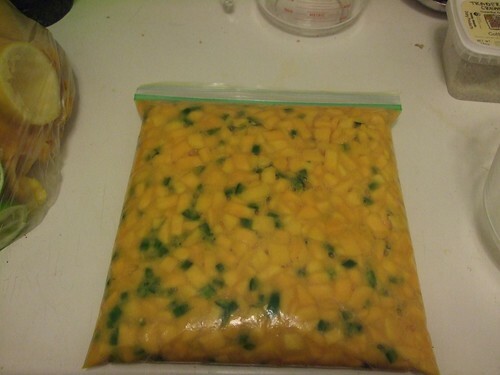 If you’re using a freezer bag like me, close the bag and toss it around, massaging the bag with your fingers to evenly distribute the jalapeño bits among the mango. 12. 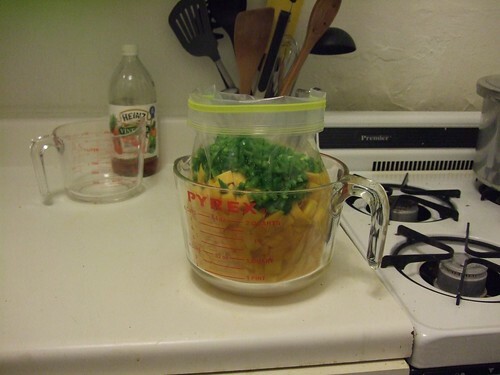 Place in the refrigerator for at least an hour, preferably several hours and ideally overnight. If you’re using a freezer bag, try to push as much of the air as possible out of the bag before closing. Also, be sure to put the bag on a plate or some other flat container, just in case there are any leaks. 13. Serve with tortilla chips or some other savory starch, such as potatoes or crackers. Well, I hope you enjoyed my first recipe! Admittedly, I’ve posted a ton of recipes on my old blog, Luis in Paris, but this is the first fully photo-blogged recipe that I’ve done, and it’s also the first recipe for this new blog. Yay! I hereby testify to the delicious results, and now I will have to make my own. Great use of photos, and excellent explanations. Thanks, Mr. Greg! Good catching up with you this weekend. BTW, for those who are interested, check out this recipe for Pineapple Salsa from Whole Foods. You’ll see that is follows the same recipe archetype, but uses pineapple and red onions as the main flavor base. Miam!! Very nice recipe post. Almost as if we were cooking together. Thanks for sharing, man!